To save money and time, it pays to tackle your painting projects yourself. For the most professional finish, you are going to need to invest in the best paint brands on the market. With the large selection of paints currently available, it can be tricky determining which one will meet your needs. Don’t spend hours trying to figure this out; I’ve already done the research for you! Follow this simple guide to find out what brand and type of paint will be best for your at-home project. 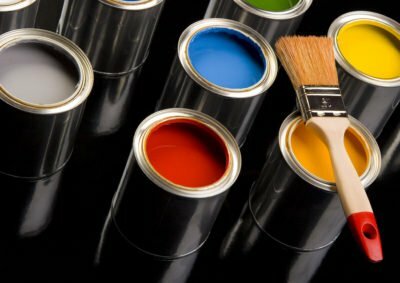 With all the different types of paint available, you need to be sure that you’ve chosen the proper kind to complete your project right. Picking a paint starts by deciding if you need a water-based or solvent-based variety. The water-based paints (typically latex or acrylic) use water as a binder. Solvent-based paints use mineral spirit or thinner as the binder. Keep in mind that there are regulations to how you dispose of a solvent-based paint. Let’s a take a look at the most commonly used paints on the market. This versatile, latex-based paint is generally used when painting walls and ceilings. Exterior flat paints can be used on a smooth or rough texture. Flat paints tend to work well in a sprayer if diluted properly. Otherwise, most people will use paint rollers and brushes for application. This paint is more durable than a flat paint and offers a slight sheen. The degree of sheen can vary between brands, so pick carefully. Most often, eggshell will be used on interior surfaces made from wood. This durable finishing paint is used on mainly interior woodwork and metal surfaces. There are solvent-based and latex-based types available. The latex-based varieties are easy to apply and won’t yellow with age. They will not, however, provide the high shine as a solvent-based paint will. Some gloss paints will be specially formulated to work on exposed exterior surfaces. There is also a wide variety of specialty paints available on the market. No matter what surface you are painting, you can’t really go wrong if you purchase one of the best paint brands on the market. Here are the top 5 currently available. This leading brand is available exclusively at Home Depot and offers a full line of interior and exterior paints. In addition to the water and oil-based varieties, you’ll also find primers, specialty finishes as well as wood-floor coatings and cleaners. There is also a select variety of Behr products available for sale at Amazon. Behr is owned by Masterchem which also owns the KILZ brand of paints and primers. They are dedicated to providing new materials, services, and technologies that will continue to expand their vast line of products. Benjamin Moore belongs to the Berkshire Hathaway companies and is owned by Warren E. Buffet. They are one of the top paint companies and work with 4,000 independent dealers. Since 1883, Benjamin Moore has been providing the highest quality materials and finishes available in the industry. By using independent retailers, they are thoroughly able to train the staff to be knowledgeable of the product and customer minded. Because of this, they have often been rated as a top company for customer satisfaction and service. With the wide variety of finishes and colors, it is easy to find a Benjamin Moore covering that will suit any project. The Olympic brand is a member of the PPG’s coatings brands. PPG is an American Fortune 500 company that is headquartered in Pittsburgh, Pennsylvania. They offer a full line of interior paints that are sold exclusively at Lowe’s. Their wide array of finishes includes paints for the ceilings, bath, kitchen as well as primers. There is also a variety of stains, cleaners, and resurfacers that are available for purchase. A few of the stains and pool paints can be found for sale at Amazon as well. By revenue, PPG is the largest coatings company in the world. Because of this and their vast paint offerings, they can be trusted to provide you with the exact paint you need for any project. As one of the largest producers of paints in the United States, Sherwin-Williams has become a household name. They also produce Pratt & Lambert as well as Thompson Minwax with their brands. They sell their interior paints and products at more than 3,000 company-owned stores for personalized attention to the customer. In addition to paints, they offer a large selection of faux finishes, primers, wallpaper and wood stains. Sherwin-Williams is also known for selling a variety of paint supplies and tools to help get the job done quickly. They are a one-stop shop for all your painting needs. This American company is based in Minneapolis, Minnesota and was acquired by Sherwin-Williams in 2017. They currently have over 11,000 employees based in 25 countries. Valspar is the sixth largest paint corporation in the world. Since 1806, Valspar has been offering a wide variety of painting materials to consumers. Many Valspar paints and materials can be found for purchase at Amazon. Valspar is most widely recognized for the large selection of colors they provide. They have some colors available that other companies have never thought of. This means you can find a unique color palette by using the Valspar brand for your painting needs. Let’s take a look at some of the best paints currently available for your specialty projects. When looking for the best paint for plastic, your best bet is going to be a high-quality spray paint like this Rust-Oleum brand. This spray is ideal for interior or exterior use on your plastic projects. In addition, it can be used on wood, metal, wicker, plaster and unglazed ceramic as well. The Rust-Oleum spray features a long-lasting finish that can be sprayed from any angle. The spray comfort tip also ensures that your finger will not become tired during spraying. This paint will dry to the touch in just 20 minutes and covers up to 12-square feet for a quick completion. With the large selection of colors, you can achieve a smooth and full coverage on any project that needs to be painted. The glossy finish allows for a fresh shine to your plastic and it has superior bonding capabilities. Painting on glass is a common DIY project that requires a particular paint. This FolkArt Kit allows for a wide variety of colors that work on more than just glass. They can be used on your canvas, wood, fabric, paper, ceramic and terracotta projects as well. This paint will be durable whether it is used indoors and outdoors. It is a great paint for brush painting, detailing, sponging, stamping and stenciling as well. The FolkArt kit contains paints that are all non-toxic and it is great to have an entire selection of colors right at your fingertips. This provides versatility to work on all the projects available at your house. Wicker White, Bright Pink, Cardinal Red, Pure Orange, Real Brown, Daffodil Yellow, Lime Green, Classic Green, Aqua, Look at Me Blue, Perfect Purple, Licorice. This Tulip Party variety pack was voted America’s favorite fabric paint. It is non-toxic and offers a fine point tip for detail work. The easy-squeeze bottle makes it ideal for anyone to apply, even children. This paint will not crack or peel, even after washing. There are 20 different colors available in this kit so you can be as creative as you wish. The cool 3D designs will offer fun on many other projects as well. Consider using them for posters, glass, wood, canvases, backpacks and school projects. This party pack is also a great option when throwing a birthday party. Every child can use one to create a memorable souvenir from the party. Sometimes you just want to apply a coat of paint and be done. That’s the time to grab the Amitha Verma Chalk Finish Paint. It provides a quick and easy way to revive your outdated furniture to give an upscale look. There is no prep work needed. You don’t need to sand, strip or prime your projects. Simply clean the area you want to paint and apply a coat. In just one application, you’ll receive full coverage with a smooth, flawless finish. You can even use the 1-quart container for multiple projects. This formula will dry in just 20 minutes. Use it on your wood, plastic, glass, concrete, and metal DIY projects. With a wide variety of colors available, you’ll want to apply chalk finish paint to every piece of furniture in the house. Finding a paint for aluminum siding can be tricky. It is important to find a brand that is durable and will stand up to the abuses of the outdoor environment. This Rust-Oleum latex paint fills that need. It isn’t just for aluminum but can be used on almost any indoor and outdoor project. This includes wood, metal, masonry, plaster and unglazed ceramic. The water-based acrylic formula offers a low-odor application. In addition, it will resist chipping and provides a durable, long-lasting protection to all surfaces. This paint will cover up to 120-square feet and will dry to the touch in just 30 minutes. The gloss finish will go on smoothly and provide a fresh new look to all areas of the home. Give your pool the look of the Caribbean! This ready to use, cement base paint is ideal for decorating and waterproofing a multitude of surfaces. Use it on concrete, gunite, plastered swimming pools and masonry. This can be applied to both above and below ground pools for a superior finish. It will dry to the touch in just 4 to 6 hours. You will also want to apply a second coat about 24 hours after the first coat. Keep in mind that it will most likely take a few days before it is ready for use. This pool paint will cover 75-100 square feet per gallon on rough surfaces. When applying to smooth surfaces, you can expect slightly more coverage. KILZ makes this high-quality paint ideal for many interior and exterior painting projects. It is known for the excellent hiding properties that it offers. In addition, this paint has great adhesion and is water repellent for most textured surfaces. The paint will apply easily and is self-priming. You can also easily clean up with just soap and water. One gallon will cover 250-400 square feet depending on the surface texture. You can choose to use a roller, brush or paint sprayer for application. Considering this is made from the trusted KILZ brand, you know it has to be good. You will need a special formulation when painting fiberglass, but Rust-Oleum has you covered. The Marine Topside Paint will provide a long-lasting finish with superior protection. It offers an exceptional finish on not just fiberglass but also wood and metal. The modified alkyd formula offers a durable finish in extreme weather conditions. There are other uses for this formula as well. Consider using it in your bathtubs, on your campers and more. While it can take a little extra searching, there is high-quality paint available for any project. Simply search through the best paint brands to find the formulation that will work for you.